The process of steam cleaning your carpet involves hot water being fed to a spray extraction tool or wand, coupled to a pump vacuum power unit. The cleaning solution is injected under pressure deep into the carpet through water jet nozzles. The water will then penetrate the fiber all the way down to the backing. This action will loosen any embedded soil, remove oil and grease deposits, and get your carpet cleaner than it has ever been. There are many types and makes of steam carpet cleaners available on the market, ranging from small portables to the large and very powerful truck mounted units. The principle is the same no matter what model you pick. state of art equipment and technology, we are more than capable of high production and cleaning of carpet. however, by a skilled operator who uses equipment that is well maintained and in good overall operating condition. 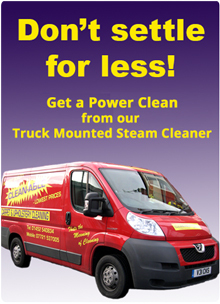 Currently, there are two methods being used with steam carpet cleaning. 1. This method involves a traffic lane cleaner being sprayed onto the traffic lanes and then agitated into the fibers. The entire area is then cleaned by using a hot water extractor that has a cleaning solution being injected into the fibers through the wand. 2. The second method involves a free rinse emulsifying pre-spray being sprayed onto the entire carpet, then agitated into the fibers. 1. Prepare the equipment and supplies. In a pump or power sprayer you should mix the free rinsing pre-spray. In the solution tank of the extractor, mix the rinsing agent. 2. If you have a lot of furniture to move, make yourself a floor plan. 3. If the area being cleaned has furniture, you should remove as much as possible. 4. Thoroughly vacuum the carpet. If the pile is crushed or matted, use a pile brush to loosen the soils which will make vacuuming more effective. 5. Pre-spray a good amount of the pre-spray. 6. Using a grooming tool, agitate the pre spray deep into the fibers then let it sit for 10 – 15 minutes, making sure that it doesn’t dry out. 7. Extract the area using a portable, truck mounted, or automatic carpet cleaner. 8. Repeat steps 5 through 7 until the entire area has been cleaned. 9. Groom the cleaned area, replace all furniture that was removed, then clean all equipment that you used. This entry was posted in Carpet Cleaning Gloucestershire and tagged Carpet cleaning, Carpet cleaning Company, Clean-Able, steam cleaning carpets, Upholstery cleaners Gloucester. Bookmark the permalink.